Diameter - 1.65m. (5 feet 5 inches). 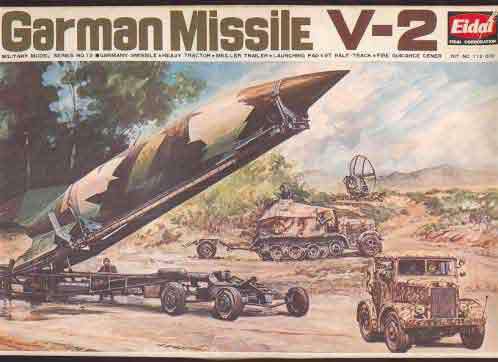 The history of the German rocket development began in 1932 when Captain Walter Domberger was assigned the task of examing the possibilities of a number of weapon projects, which appeared to be of benefit in het future war. The first rocket designed by the team was the "Agregate 1" (A1).The development continued with the rockets A2 and A3. From the first startof the A3 on 6th December 1937 there was a series of failures. 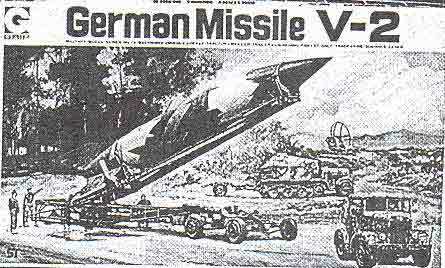 Due the failures the development of the A4 missile was suspensed. 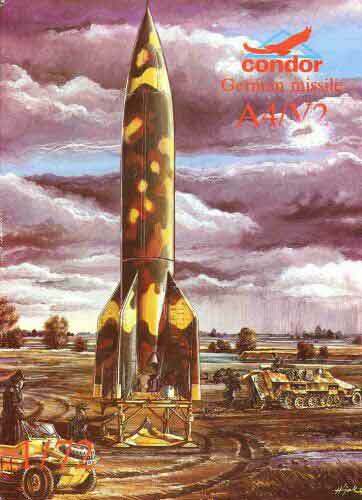 In 1937 a new research rocket A5 was introduced as a further step towards A4. The A5 used the same engine as the A3, together with gas rudders so that the problems with the stability and aerodynamics could be solved. After succesful tests of the A5, construction of the A4 resumed. Where as the A5 was 6.85m (22 feet 1.5 inch) long and 0.67m (2 feet 2.5inches) in diameter and weighed around 900 kg. (1980 pounds), the A4 was to be 14.04m. (46 feet 0.5 inch) long by 1.65m. (5 feet 5 inches) in diameter and have a operational weight of 12.840 kg. (28250 pounds). To lift such a great weight a quite new rocket engine had to be developed. The development of this engine, which was more powerful than any other before the war or for some time after, was supervised by dr. Walter Thiel, until his death in an air raid in 1943. The design of the engine was may be the most revolutionary feature of the rocket. A new and advanced pomping system was developed to transport liquid oxygen and alcohol as a fuel into the combustion chambers. This system consisted of a turbin operated by vapour released by hydrogen peroxide. The firing test of the A4 were carried out of the Army Rocket Establishment at Peenemunde on the Baltic coast. The rocket program was accelerated and on the 5th November 1943 a training battery started firing tests in the area near Blizna in Poland. The tests did not go on succesfully. 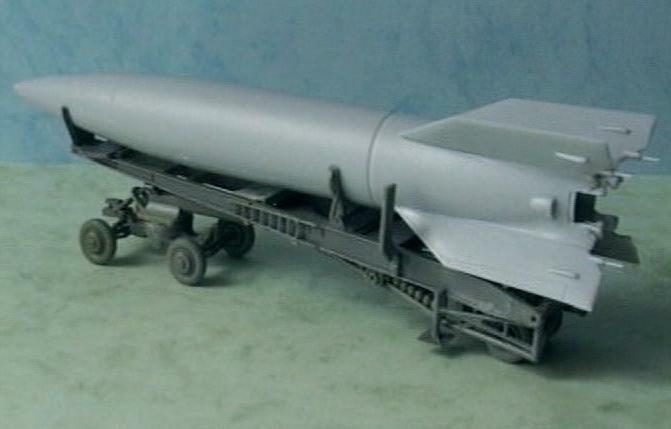 The basic design of the missile was blamed for many faillures. A number of modifications were made including the strengthening and isolating of feul tanks. A further series of firings tests were carring out near Blizna in September and October1944 and the results proved that the teething troubles were now all over.Solving of the final technical problems was begun just in the time the first German Rocket troops being deployed in areas near The Haag (The Netherlands) and Liege (Belgium). It was the 444the battery of the Mobile Artilery Section that launched the first A4 offensive on 5th September 1944 against Paris. A4 was in that time renamed in to "Vergeltungswaffe 2", (V2), (the revenge weapon2). In total about 5500 V2 rockets were fired against targets of Allies between 5th september and 27 March 1945. Of these some 2000 hit London or its surroundings, 1600 hit Antwerp and the rest hit other targets or failed. 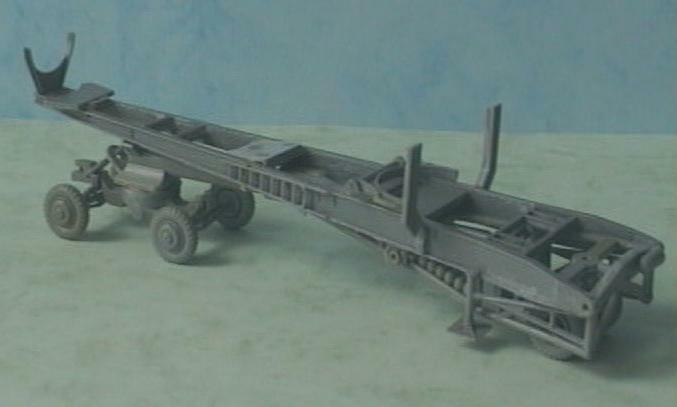 The old kit from "GRIP"
The V2 unit (Meillerwagen, V2 missile, Hanomag SS100 tractor and Launching Control Car Sdkfz. 7/3 are a long time ago released by GRIP and later by EIDAI. The kits were basic. 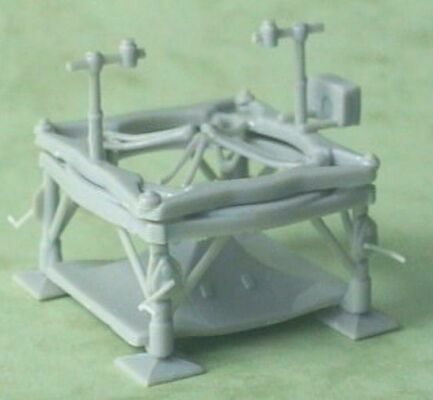 The kits on this page are remakes from the kits from GRIP or EIDAI. 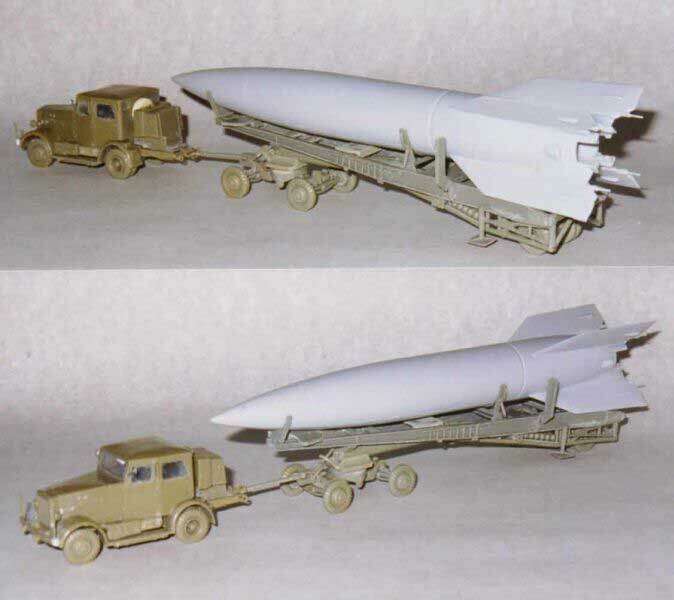 The Condor kit 001, scale 1/72 are available by MPM Ltd., Druznosti 6, 140 00 Prague 4, Tsjechië. (6G1 Hanomag SS-100 tractor, 6G2 Meillerwagen V2 missile trailer and 6G3 Luanching Control Car Sdkfz. 7/3 are from Resin Master Melboune Australia and available by "OSTMODELS", 8 Kingswood Cresent, Berriedale, Tasmania 7011, Australia. Resin Master have more fine kits and they have the intention to release in the future a line of Armoured-Draisines. 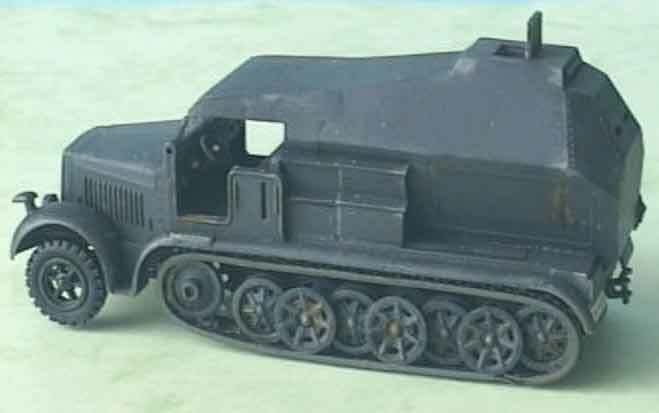 One "Armoured tank transporter railway carriage" is available.